Searching for SSC CPO Admit Card 2019? No more worries, as the Officials of Staff Selection Commission released the SSC CPO SI Hall Ticket and SSC CPO ASI Hall Ticket 2019 on 26th February 2019 along with the SSC CPO Exam Date 2019. Accordingly, the applicants can download their desired SSC CPO Admit Card 2019 to know individual Exam dates. Eventually, the Higher Authorities of SSC palled to conduct the Written Test from 12th To 16th March 2019. So, we suggest all the applicants prepare well for the Exam by knowing the complete details of the SSC CPO Selection Process. Scroll down for detailed information. Recently, the Staff Selection Commission released the Admit Card for 1223 Sub-Inspectors, Assistant Sub Inspectors posts. Since there is heavy competition for those SI and ASI posts this year. The Board members decided the SSC CPO Exam Date 2019 and are ready to conduct the SSC CPO Exam 2019 from 12th March To 16th March 2019. So, candidates are suggested to prepare well for the Exam and get placed Across India. Getting placed in the Staff Selection Commission and Central Police Organization is not an easy task. Go through the entire post to know the detailed information of the downloading process and access the direct download links to get their SSC CPO SI Hall Ticket 2019. The SSC CPO Selection Process 2019 includes Written Test followed by the Personal Interview. The candidates should attempt the Exam with their best efforts. Soon, after knowing the Results, candidates who got selected in the Written test are promoted for further rounds of the selection process that is Personal Interview. Also, to some extent the candidates should attend for the Document Verification Process in the worst case, if the number of candidates appeared for the Exam are more. So all the best for those applicants and can prepare well for the Exam by preparing from the Previous papers available on our website. Candidates should bring the printout of their ssc.nic.in SSC CPO Admit Card 2019 in the examination hall. The candidates should note that the SSC CPO SI Hall Ticket 2019 will have some instructions for the exam day and that they should be obeyed by all. A candidate is advised to validate all the details on their SSC CPO ASI Admit Card 2019. Make a click on the Admit Card column appeared on the Home Page of SSC. Now a table containing several regions appeared on the new page. Next, choose the Central Region or your desired other regions and click on it. Later, simply click on the Proceed Now button. Over there, we have several options like if Roll Number is known, if Roll Number is not known, and for Online Applicants. Choose your desired option and fill the details like Registration ID, Date Of Birth and Verify Human fields. Recheck once before you submit the details. 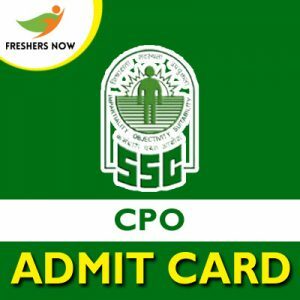 Finally, download the SSC CPO Admit Card 2019 to your device and keep it safe till the Examination. Hence, got all the details about SSC CPO Admit Card 2019? For such similar details come back to our website Freshers Now.